Do Dogs Instinctively Love People? What do you think of the following quote about the dog-human relationship? How true is it? When examined as it is, out of context, it appears that this quote from Darwin’s On the Origin of Species, is talking about the attachments that dogs form with people. We’ll address this interpretation first and then later go back and look at the quote in context. There has been some controversy over the years about whether the dog’s ability to form attachments to people is instinctive or learned. Early animal behaviorists believed, like Darwin, that dogs evolved this ability as a result of domestication, because at the time they believed that wild animals wouldn’t form these attachments, even though they might be tamed. Darwin clearly believed that instinctive behavior was inherited, genetically determined and mostly unlearned. As we’ve talked about in webinars and articles on genetics and behavior, this is a misunderstanding of how behavior develops in animals. All behavior is an interaction of genetic predispositions and environmental influences. The term “instinctive” sets up a false dichotomy between nature and nurture and has largely been abandoned by animal behaviorists. The original context for Darwin’s quote was a discussion about how the behavior of our domestic animals has changed through the process of domestication and not really about the love or attachment that dogs have to people. So Darwin thought that our dogs express their love of people by not attacking our other domestic animals. As he admits, in his time as in the present, dogs do attack other domestic animals, but it appears that they do it less than wild predators. To our knowledge, no one has ever gathered evidence in support of that supposition so we can’t be sure. But if it is true, it is an oversimplification to attribute it solely to genetic changes occurring through domestication. There likely have been changes in dog social behavior as the result of genetic selection during domestication. Just exactly what those changes are, are a matter of some debate. To sum up, we would not conclude that dogs’ “love of man” is “instinctive” as Darwin held. The tendency or propensity to form close social relationships with people may have a genetic basis but certain early environmental experiences are required for that tendency to be expressed. And secondly we don’t know if a reduction in predatory behavior in dogs is related to dogs’ attachment or love for people as Darwin supposed. So on the truth meter, this quote gets a zero. 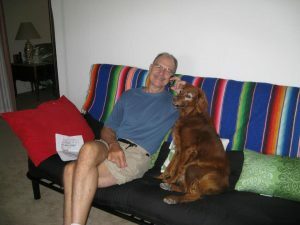 This article was based on another one in the series “Some Popular Sayings About Dogs – How True Are They?” which appeared in the members-only section of the Behavior Education Network. Learn more about all the educational resources about pet behavior available in BEN by clicking on the “Home” button at the top of this page. Thanks – the "What Does Your Dog Do When" assessment ...has been helpful and I’ll be adding those [questions] to my history questionnaire!